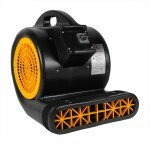 These carpet cleaning air movers can be stacked 4 high. Whether you're a carpet cleaning professional, or just an individual who routinely cleans their carpets at home, this is the perfect air mover for you. With a very small amp draw (3.0 peak amp draw), you can run multiple fans off of the same electrical outlet. This speeds up the drying time for the professional cleaner, allowing you to finish more jobs in a shorter amount of time. You can stack these fans up to 4 units high for easy storage or transport. Weighing in at only 15 pounds, means you don't have to struggle when carrying multiple units in and out of every job. With the compact shell, lightweight, and stackability option, you save room when transporting them, allowing you to either carry more fans, or more carpet cleaning supplies with you. Another great way to utilize this Xpower carpet cleaning air mover is as a restoration fan. The low amp draw is very attractive because some of those areas that have water damage are without electricity. So, something that draws small amounts of power can be run off a generator, drying areas quickly without the worry of when the power will be turned back on. We have a few other models, like our Shop-Vac® Mighty Mini air mover, that pull less amps. 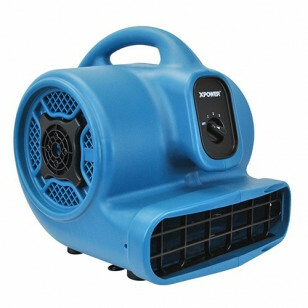 But, none of our air moving carpet dryers have the combination of power and low amp draw that this Xpower model does! Wet carpets don't stand a chance with this 3-speed, 1600 CFM air mover. Injection molded housing is a 2-piece housing that is bolted together, for ease of access to internal components. 5 year warranty on the housing and 1 year on parts. This is a review for the Xpower 1600 CFM Carpet Cleaning Air Mover.